Ferrymead Heritage Park’s origins date from 1963 when Christchurch railway and tramway preservation organisations encouraged the Heathcote County Council to buy land, which included part of New Zealand’s first steam railway. 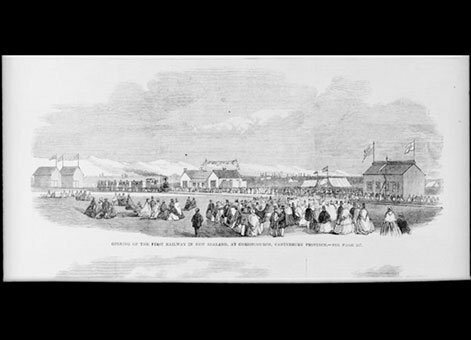 Christchurch settlement was established in 1850. Within ten years 12,000 people lived in Christchurch and there was strong support for a railway because it was difficult to get goods from Lyttelton’s deepwater port into the city. The Provincial Council soon committed itself to a relatively expensive tunnel and railway project using the Indian gauge of 5 feet 6 inches. The contract for the project was let on 16 April 1861 and the railway’s first sod was turned at Ferrymead on 17 July 1861. The first engine steamed on 17 November 1863 and the branch line officially opened on 1 December 1863. However, the line’s gauge had been changed to 5 feet 3 inches so a cheaper locomotive could be used, which the contractor sourced from the near-bankrupt Australian company, Melbourne and Essendine Railway. Some 74 miles of broad gauge lines were built before gauge conversion to 3 feet 6 inches was completed in December 1878. Illustrated London news: Opening of the first railway in New Zealand, at Christchurch, Canterbury Province. [1 December, 1863] London, 1864. Ref: PUBL-0033-1864-241. Alexander Turnbull Library, Wellington, New Zealand. http://natlib.govt.nz/records/23018228. For nearly 90 years the Ferrymead branch formation stood empty in the midst of swampy fields. However, community attention was concentrated on Ferrymead by the railway’s centenary in 1963 and the end of New Zealand Railway’s (NZR) steam locomotion. This community interest resulted in the local County Council buying the 100 acres the present complex is built on. All buildings and other facilities have been relocated to the site since. A large number of interests and societies are housed on site operating as part of the Ferrymead Trust. The pioneer village is a fully working town, set mainly in the Edwardian period. Numerous museum buildings around the village cater for many interests with aircraft, fire engines and other vehicles and models on display. Part of the heritage electrical equipment is a walk-through substation displaying the mercury arc rectifiers that provide Direct Current (DC) traction power for the electric railway, the street tramway and trolley buses. Railway track-laying began on site from 1965. The first locomotive to run on the present Ferrymead Railway (FR) steamed there on 11 March 1967. There is a permanent connection to Kiwirail’s main line, across which rolling stock is interchanged. FR has concentrated on restoring rolling stock for use on its own line which extends from the main line junction to Ferrymead station, site of the original railway wharf. Passenger trains run between Ferrymead and Moorhouse station at the pioneer village. A major achievement has been electrifying this at 1500 volts DC. FR has mainly smaller steam industrial use locomotives dating back to before World War One, including the first locomotive built in NZR’s own workshops, W 192, a 37 ton 2-6-2T from 1889. Examples of all DC electric locomotives and earlier diesel ones are also in the collection. In the early 2000s the park’s Diesel Traction Group overhauled an English Electric 750 h.p. locomotive and a diesel railcar of 1939 for a celebration weekend. The heritage train comprises beautifully restored four-wheeled rolling stock from the 1870s. The Tramway Historical Society (THS) has built an electric tramway about a mile long paralleling the FR. THS moved to Ferrymead in 1967 after an initial period restoring vehicles in the Christchurch Transport Board workshops. Operations opened on 6 January 1968, using the last of the city’s eight Kitson steam motors to haul Victorian trailers. The tramway is also electrified and trams travel around a loop from Ferrymead station along the streets of Moorhouse. Among Ferrymead’s trams is Christchurch No. 1, originally built in New York in 1905. The New Zealand trams operating on the city centre heritage tramway have all been restored on site. Admission prices and other access information is available on the Ferrymead Heritage Park website. 50 Ferrymead Park Drive, Heathcote, Christchurch, Canterbury.